On October 15, 2011 there was a short spell of dry sunny weather. Others were busy occupying the Art Gallery, we decided to take bikes on a ride up the Seymour Valley Trailway. This is 11km of mostly paved, two way multi-use trail which parallels the Seymour Mainline (the service road for the waterworks which is not open to the pubic). It does have some grades – and in several places barriers have been placed to slow cyclists coming downhill. We got there late morning, and it was already busy especially at the southern end. 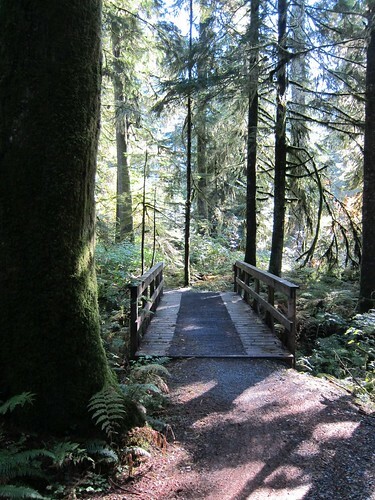 Many people treat the trail as a time trial – a sort of cyclists equivalent to the Grouse Grind. But there are also skaters and boarders and at the Rice Lake end lots of little kids on bikes too. We just went up and back – missing the mid valley viewpoint. At some future date we will return for the twin bridges and Fisherman Trail. Not to carp, but it does seem a bit sad that there is no access to the dam – or even a bridge connecting the top end of Spur 4 to Coho Trail which would make a long loop possible. The trailway has the picnic sites and pit toilets, Spur 4 has none but has vehicle traffic (according to the map). As I observed in Episode Eight, people going out for a ride do seem to like coming back a different way. The pictures that I took that day were nearly all in the old growth forest area beyond kilometre 10. 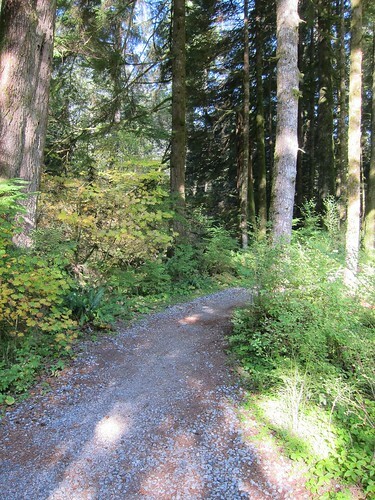 For this area the paved trail ends, and it becomes several trails, mostly gravel with occasional wooden bridges. These end at the fish hatchery – which is open daily. There is a steep gravel road for access to the dam, but most of that is closed to the public. There is a small viewing area with a gazebo up to the left of the dam and a small picnic area beyond that. I used the camera zoom to edit out the dam and a large crane for a more “natural” landscape view, but of course it isn’t natural, being mostly second growth forest (active logging ended in 1994) specifically managed for water storage. (I am quoting the metrovancouver pamphlet). 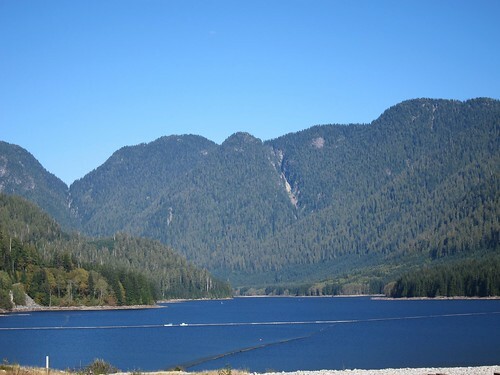 This was actually our second visit to the area – we came before for a gentle stroll around Rice Lake and the Lynn Canyon. The 22km round trip is a bit more demanding – but with plenty of places to stop and look around all the way, need not be. If you have smooth tires you will be fine on the trail way, but some more traction might be a good idea on the gravel. When we used it, we both had smooth tires and no problems, as it was at least as good as the Richmond Dyke: it is also fairly level between km 10 and 11. Being October, it was distinctly chilly in the shade of the tall fir trees. The grades were more of a struggle in some places than the headwinds, and yes, I did get off and push now and again. But I was carrying the picnic supplies! The area is not formally a park, but is a place that deserves a visit, even if you do not have a bike. Bus Route #228 gets you close to the Rice Lake Gate. We had our picnic at the hatchery. Getting the bikes up to the single table nearer the dam would not have been easy. People seemed to leave their bikes at the foot of the hill.